Lights down. Spark up. The boys from South Gate came to party. Few were sitting in their seats come seven o’clock, the supposed “start” of the concert, for it was all too predictable that Cypress Hill would begin a few minutes late. Crowds flooded into the Greek theatre though when B-Real and Sen Dog took the stage, and a cloud of marijuana smoke quickly cut through the crisp autumn air. Leading the blaze was B-Real himself (High Times 2014 Stoner of the Year) puffing on a foot long blunt while blowing out classic stoner joints such as “Hits From The Bong”, “Dr. Greenthumb”, and “I Wanna Get High”. Sen Dog helped kick things back to their Latin roots by performing Tequila Sunrise and Latin Thugs. In just an hour, The Hill managed to bring energy, passion, and membrane insanity to a now packed house. The stage was set for Thievery Corporation. When founding members of Thievery Corporation Eric Hilton and Rob Garza met in D.C. during the 90’s, they immediately connected through their infatuation of the Brazilian bossa nova movement. Now with a complete ensemble behind them, the duo decided to return to their roots with their most recent album, 2014’s Saudade, and the swaying, big-band sound that encapsulates the soul was imminent from the get go. Adding to Thievery’s unique sound is their collaboration with multiple vocal artists from album to album and track to track. Five were on hand for the performance: Loulou Ghelichkhani, Natalia Clavier, Mr. Lif, Sleepy Wonder and Archie “Zeebo” Steele. After showcasing newer singles from Saudade like Firelight and Depth of My Soul, the headliners mixed in classic favorites such as Amerimacka, Sweet Tides, and All That We Perceive. Wishing to honor one of their funky, psychedelic influences, Mr. Zif provided vocals while covering The Grateful Dead’s Fire on the Mountain. After a brief interlude Thievery Corporation returned for an encore, highlighted by their most popular (and my personal favorite) song, Lebanese Blonde. 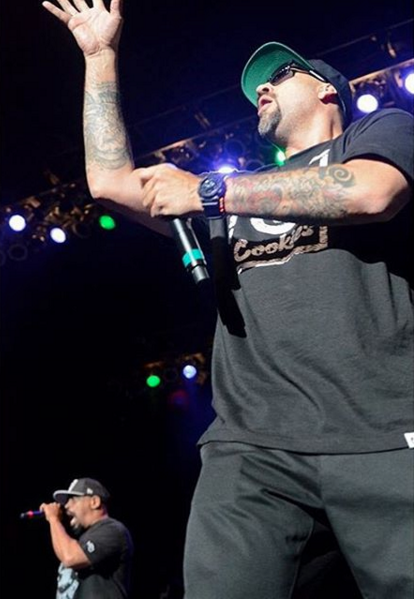 Cypress Hill was a great opener, playing in their own backyard and providing the audience with “good vibrations”. Thievery Corporation capitalized on the atmosphere and moved the audience for a solid two hours with their melodic jams. With the beautiful Greek Theatre providing a serene backdrop, it was a great scene to groove to on a cool Friday night.